This black hole bounty consists of stellar-mass black holes, which typically weigh between five to 30 times the mass of the Sun. 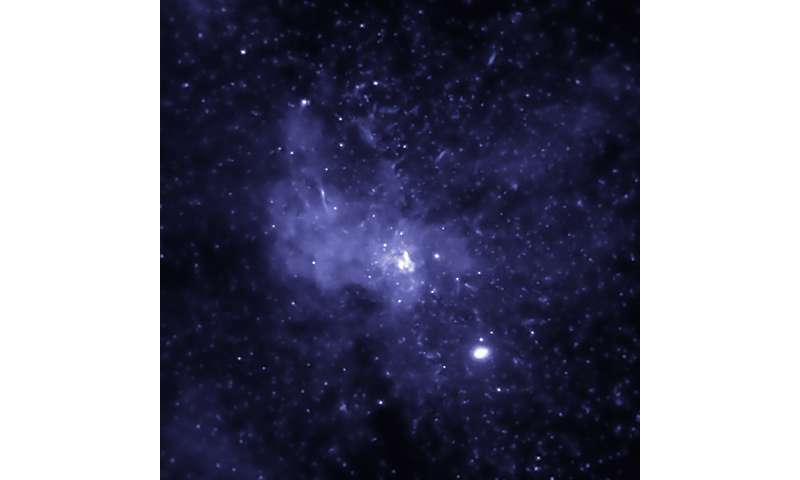 These newly identified black holes were found within three light years—a relatively short distance on cosmic scales—of the supermassive black hole at our Galaxy's center known as Sagittarius A* (Sgr A*). Theoretical studies of the dynamics of stars in galaxies have indicated that a large population of stellar mass black holes—as many as 20,000—could drift inward over the eons and collect around Sgr A*. This recent analysis using Chandra data is the first observational evidence for such a black hole bounty. A black hole by itself is invisible. However, a black hole—or neutron star—locked in close orbit with a star will pull gas from its companion (astronomers call these systems "X-ray binaries"). This material falls into a disk and heats up to millions of degrees and produces X-rays before disappearing into the black hole. Some of these X-ray binaries appear as point-like sources in the Chandra image. A team of researchers, led by Chuck Hailey of Columbia University in New York, used Chandra data to search for X-ray binaries containing black holes that are located near Sgr A*. They studied the X-ray spectra—that is the amount of X-rays seen at different energies—of sources within about 12 light years of Sgr A*. Only the brightest X-ray binaries containing black holes are likely to be detectable at the distance of Sgr A*. Therefore, the detections in this study imply that a much larger population of fainter, undetected X-ray binaries—at least 300 and up to a thousand—containing stellar-mass black holes should be present around Sgr A*. A paper describing these results appeared in the April 5th issue of the journal Nature.